Site Safety: Preventing Falls When Removing Snow – Sapia Builders Corp.
Every year, workers are killed or seriously injured while performing snow or ice removal from rooftops and other building structures, such as decks. Snow removal is performed for a number of reasons, such as to prevent overloading and collapse, or for construction or repair of decking or roofs. Often workers climb directly onto the roofs or structures and use equipment such as shovels, snow rakes, snow blowers, ladders, etc. Other times these operations may be performed from the ground level using snow rakes. Aerial lifts are sometimes used to access roofs and apply de-icing materials. Snow removal operations are often performed under extreme weather conditions (e.g., cold, high winds, icy surfaces). Workers who perform these activities may have little experience or training on the hazards of such operations or work. Workers performing snow removal operations are exposed to many serious hazards. Based on OSHA investigations falls cause the most worker fatalities and injuries during rooftop snow removal. Workers may fall off roof edges, through skylights, and from ladders and aerial lifts. Workers may also be injured or killed by a roof collapse. OSHA requires that employers plan ahead and use the proper protective measures to protect workers engaging in snow removal activities. 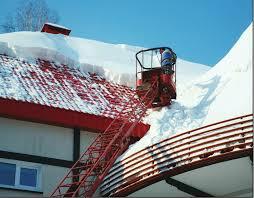 This includes snow removal by workers from commercial and residential buildings, ﬂat roofs and pitched roofs. Using snow removal methods that do not involve workers on roofs, such as snow rakes or drag lines from the ground and / or use ladders to apply de-icing materials. Evaluate Load Bearing on the Roof or Structure – Before workers access a roof or other elevated structure, the employer should confirm that the workers weight and any equipment used can be supported by the roof or structure without causing a collapse. Workers should always use caution by remaining alert to unexpected sounds or movement around surfaces that have been weighed down by snow (or water from melted snow), because these surfaces could collapse. Shoveling or raking a roof without using the proper procedures can also increase the risk of roof collapse by creating an unbalanced load on the roof. To prevent unbalanced loading during snow removal, workers should remove snow uniformly across the roof and avoid making snow piles on the roof. Plan Ahead for Safe Snow Removal from Roofs – Before snow starts to accumulate identify what will be needed to safely remove snow from roofs or other elevated surfaces. Mark out any hazards on the roof that might be hidden by the snow so that workers can see them any skylights, roof drains, vents, electrical wires, etc. Think about what tools, equipment, protective devices, clothing and footwear workers will need and how to access and get mechanized snow removal equipment safely elevated to the area or roof. Ensure that fall protection gear and safety rails are available and used to protect workers on roofs and other elevated surfaces. BE SAFE, KNOW THE HAZARDS OF SNOW REMOVAL FROM ROOFS & ELEVATED AREAS! Sapiacorp. is in Essex, Connecticut. Can I move in?? That’s gorgeous!! Sapiacorp. is at Old Black Point Association. Kids are so lucky to have handy daddy. My kids are so jealous. I miss the Restaraunt..!!! Rachel was a great chef. Sapiacorp. is in Old Lyme, Connecticut.